In a blatant plug for the Reagent Guide, each Friday for the forseeable future here I will profile a different reagent that is commonly encountered in Org 1/ Org 2. Of all the reagents I encounter as a tutor in organic chemistry, I’m not sure there’s one that makes me want to rip my hair out more than chromic acid. I don’t have a lot of hair so I don’t say that lightly. The thing is not that it is a particularly tricky reagent. It is, in fact, quite straightforward, once deciphered. What makes it tricky is the vast number of different ways that textbooks (and instructors) show it being used in reactions. Here’s the thing: Chromic acid, H2CrO4, is a strong acid and a reagent for oxidizing alcohols to ketones and carboxylic acids. For fairly mundane reasons owing primarily to safety and convenience, chromic acid tends to be made in the reaction vessel as needed (through addition of acid to a source of chromium), rather than being dispensed from a bottle. And that’s where the trouble begins. Choosing a source of chromium to make H2CrO4 from is a lot like choosing a favorite brand of bottled water. Beyond the packaging, they’re pretty much all the same. Depending on which textbook or instructor you have, however, you might see several different ways to do this, and it can be very confusing. The key point is that Na2CrO4 (sodium chromate), Na2Cr2O7 (sodium dichromate), K2CrO4 (potassium chromate), K2Cr2O7 (potassium dichromate), and CrO3 (chromium trioxide) are all alike in one crucial manner: when they are combined with aqueous acid, each of them forms H2CrO4, and ultimately it’s H2CrO4 which does the important chemistry. Unfortunately I rarely see this point explained in textbooks. I remember this causing some confusion for me when I took the course. The K or Na ions present are just spectators. 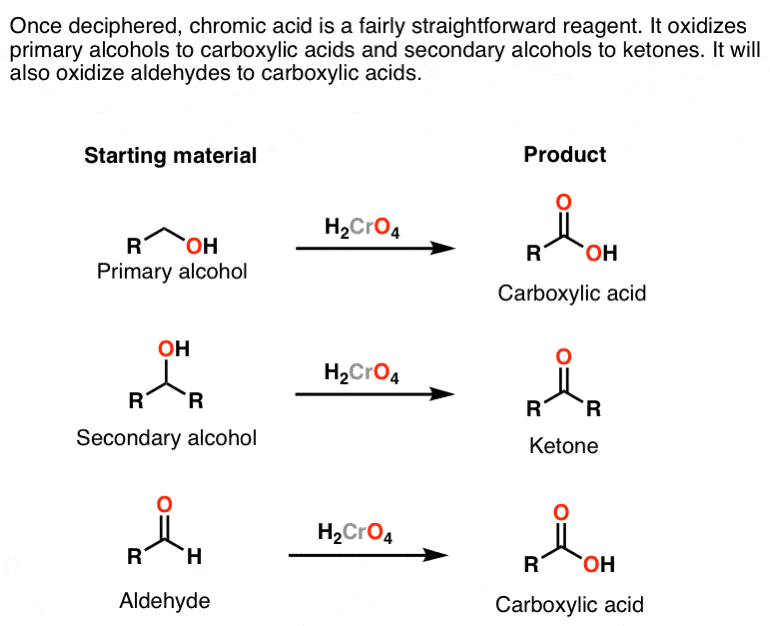 Once H2CrO4 is formed, its reactions are pretty straightforward: it converts primary alcohols (and aldehydes) to carboxylic acids and secondary alcohols to ketones. It does this through addition of the alcohol oxygen to chromium, which makes it a good leaving group; a base (water being the most likely culprit) can then remove a proton from the carbon, forming a new π bond and breaking the O-Cr bond. I wish I could tell you that navigating this confusion is ultimately rewarding due to the vast usefulness of H2CrO4 as a reagent. In fact, due to its high toxicity, chromic acid tends to find very little use in the organic chemistry laboratory outside of undergrad labs. There are far more useful reagents out there for performing these transformations. P.S. You can read about the chemistry of chromic acid and more than 80 other reagents in undergraduate organic chemistry in the organic chemistry reagent guide, available here as a downloadable PDF. It seems the carbon chain on the primary alcohol got one element longer during the first step of the oxidation mechanism. Is this wrong, or am I simply missing something here? Great blog, by the way. It’s a pleasure to learn ochem from someone who takes his time explaining things for a change! Oh crap. Thanks for pointing out the error, I’ll fix it first chance I get. 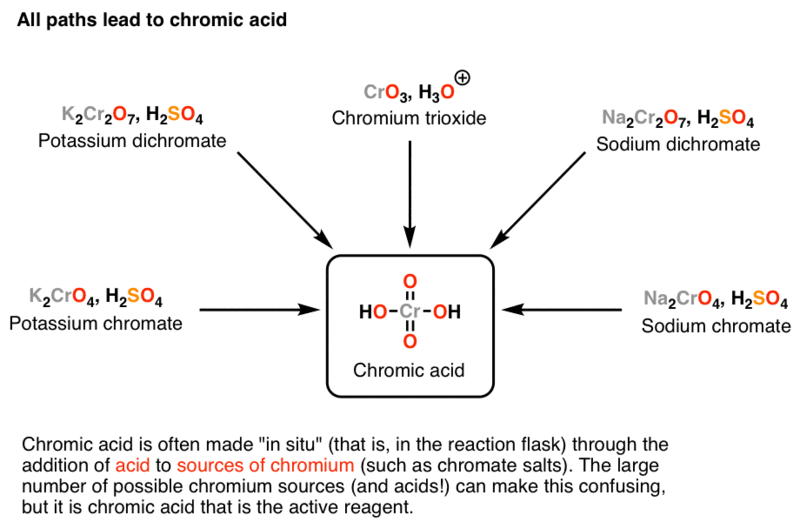 In my textbook, the oxidation with the chromic acid is the following: H2CrO4 adds a proton on one of its OH-groups, and then the primary/secondary alcohol does an SN2 reaction while H2O is the leaving group. But I think your mechanism is more correct, because if you look at chromic acid, it has both keton groups and alcohol groups. pKa for ketones is about 20-24 and for alcohols 17. So ketones want to share their electrons more than alcohols, because they are more basic. So the proton will add to the keton group instead of adding to the alcohol group. Is this a correct explanation? but I don’t see where the CrO2 comes from (the leaving group) because when the leaving group leaves the alcohol molecule (that becomes a keton), you have H3CrO4- and when water leaves from this molecule, HCrO3- remains? I don’t know how the CrO2 molecule is formed. H3CrO4 decomposes into water and CrO2, and the leftover hydrogen joins up for the acid. in my textbook (Bruice), the OH-group attacks the proton instead of the keton-group, and then the alcohol does a SN2 reaction on the protonated chromic acid, with water as the leaving group. But I think your mechanism is more correct, because the pKa of a keton is slightly higher than the pKa of the alcohol. So the keton (more basic) wants to share its electrons more than the alcohol and that’s why the keton is protonated instead of the alcohol functional group. I couldn’t see my own comments, and that’s why I wrote it again. now there’s two of it…. I’m so sorry, I didn’t want to spam this page. I’m a fan of Grossman’s statement that in the context of introductory courses we should emphasize *reasonable* reaction mechanisms rather than the absolutely most correct one. I think both mechanisms described are reasonable. The “SN2 on the metal” has the advantage of being simpler to draw. The mechanism I drew is probably more consistent with experiment. As for the byproduct I think I dropped an arrow where I should have shown net loss of OH from the chromium to get HOCr(O)OH (H2CrO3). This is the species that loses water to get CrO2. Hi, Can you please help me with a related question? What is the reaction when you mix acetic acid and chromic acid? I have encountered this problem in my class and I have no examples showing what happens. Thanks! 2-Phenylethanol yields what acid upon treatment with COLD chromic acid? 2-Phenylethanol yields what acid upon treatment with HOT chromic acid or permanganate? I know both the answers, but I don’t understand the DIFFERENCE in cold and hot chromic acid. I did a Google search and, not unexpectedly, I returned nada. Jamaal: I think the issues is that, if done carefully, chromic acid only oxidizes primary alcohols to aldehydes, but with harsher conditions, it oxidizes them to carboxylic acids. So with cold temperatures, limited chromic acid, and short reaction times, it is possible to get an aldehyde as a product, but with heat, excess chromate, and longer reactions, the carboxylic acid is the usual product. How does it react with acetylene ? What’s the product ? when mixing this chemical chromic acid w/ with water, you said it creates Aldehyde Hydrate. so this chemical is water soluble, Does this chemical deplete oxygen. The reaction is usually run in acetone or other organic solvent. 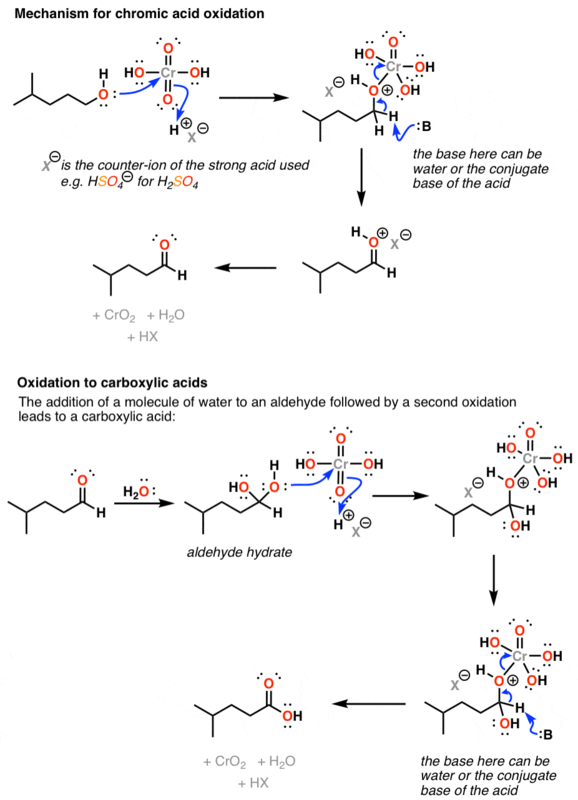 Whether or not an aldehyde is water soluble would depend on the length of its alkyl chain. After butyraldehyde, the water solubility tends to decrease significantly. What does it do to 3° alcohol? Well, it won’t oxidize the tertiary alcohol. But heat it enough and the acid will dehydrate the alcohol, possibly giving an alkene. My professor actually says that chromic acid cannot chew all the way onto the akyl to form a carboxylic acid, so I do not know who to believe. How does H2CrO4 reacts with alkene and alkyne ?